A vending machine in the front lobby of the Brooklyn Public Library, one of two dispensing the 20-ounce sugary drinks Mayor Bloomberg wants to ban. Since Mayor Bloomberg is so determined to prevent privately owned New York businesses from selling sugary drinks in sizes larger than 16 ounces, you would think he might take action to prevent the actual New York City government agencies he controls from doing the same. 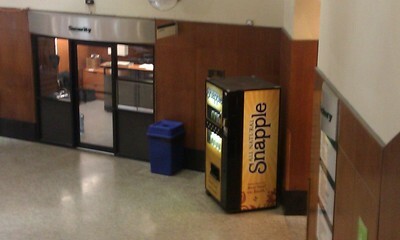 Yet in the lobby of the central Brooklyn Public Library today, I encountered not one but two Snapple vending machines offering for sale non-diet beverages in 20-ounce bottles. All too often this is how government regulation works — the government tries to impose rules on the private sector, complete with penalties for failing to comply. But the government itself doesn't follow the rules it tries to make the private sector obey.